A major challenge posed by real-world applications involving spatial information deals with the uncertainty inherent in the data. One type of uncertainty in spatial objects may come from their existence, which is expressed by a probability accompanying the spatial value of an object reflecting the confidence of the object’s existence. A challenging query type over existentially uncertain data is the search of the Nearest Neighbour (NN), as the likelihood of an object to be the NN of the query object does not only depend on its distances from other objects, but also from their existence. 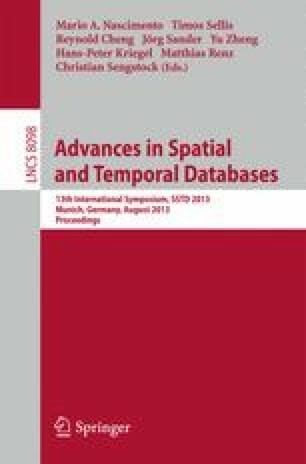 In this paper, we present exact and approximate statistical methodologies for supporting cost models for Probabilistic Thresholding NN (PTNN) queries that deal with arbitrarily distributed data points and existential uncertainty, with the aid of appropriate novel histograms, sampling and statistical approximations. Our cost model can be also modified in order to support Probabilistic Ranking NN (PRNN) queries with the aid of sampling. The accuracy of our approaches is exhibited through extensive experimentation on synthetic and real datasets.